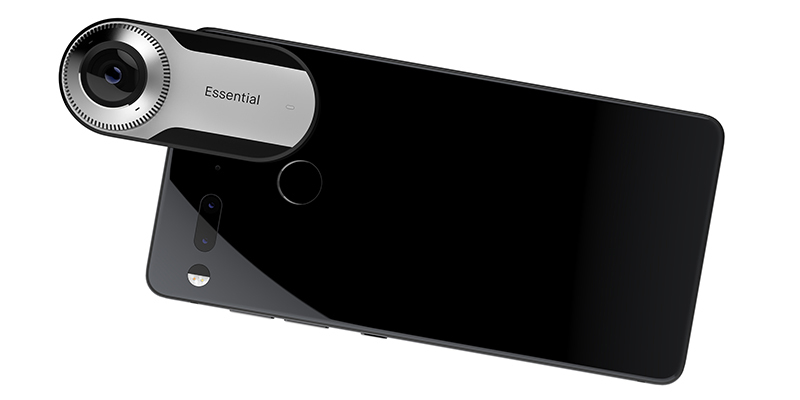 Andy Rubin, co-founder of Android and now CEO of Essential Products, recently unveiled his company’s first products: the Essential smartphone, a 360° camera accessory, and the Essential Home—a smart home assistant to compete with Amazon’s Echo and Google’s Home. The hardware inside the Essential PH-1 is what you would expect for a premium phone: Snapdragon 835 SoC, 4GB of RAM, and 128GB of UFS 2.1 storage. It comes with the latest connectivity options too, including 802.11ac Wi-Fi, Bluetooth 5.0 LE, NFC, and a Snapdragon X16 LTE modem that makes the phone compatible with all US networks. However, a few items some people find essential are missing; there’s no microSD card support for storage expansion, no support for dual SIMs, and no 3.5mm headphone jack (it will come with an adapter). The 3040 mAh battery, essentially the same capacity as the Galaxy S8’s 3000 mAh pack, should be adequate for most people, but power users will likely find themselves using the Essential’s 27W quick charge feature. Its camera arrangement also sounds suitable for a high-end device. The dual-camera module around back contains a 13MP color sensor and a 13MP monochrome sensor, which captures about twice the amount of light as the color sensor without an RGB Bayer filter to block incoming photons. In addition to capturing better black-and-white images, the Essential also combines the luminance data from the black-and-white sensor with the color data from the other sensor, which should produce brighter color images with less noise and better contrast. This actually sounds very similar to the camera setup in Huawei’s P9 and Honor 8. The Essential lacks OIS like the newer Huawei P10, but its wide-aperture lens (f/1.85) should let in more light, so this may not be a disadvantage. 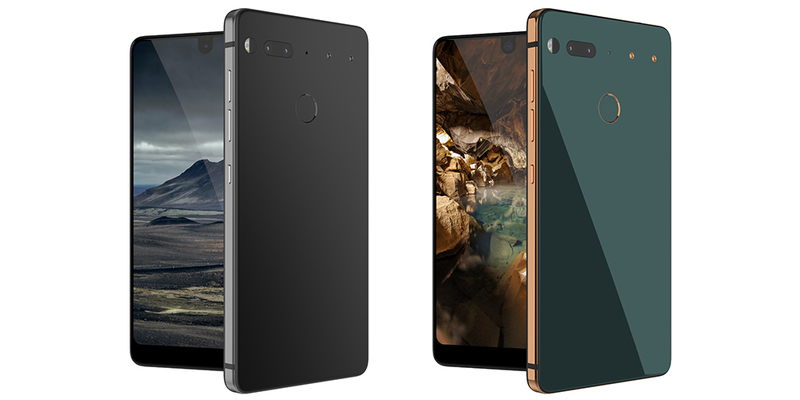 It’s not what’s on the inside that distinguishes the Essential phone from other flagships, though. Premium design and materials are its hallmarks. The frame is made from titanium, which is stiffer and stronger (and heavier) than aluminum. Essential Products says this makes its phone more resilient to bending, scratching, or denting when dropped or mishandled. A piece of polished ceramic forms the back, giving the phone a sleek, glossy look that’s completely free of any logos or markings, although the quick accumulation of fingerprints will lower its lustre. There’s a fingerprint sensor right where you would expect, and lined up in a neat row along the top is the dual-tone LED flash and laser unit—part of the rear camera’s PDAF, laser AF, and contrast AF hybrid autofocus system—the flush-mounted dual rear camera, one of 4 total microphones, and two power pins. Those power pins are part of the Essential’s Wireless Accessory Connector that allows optional accessories, such as its 360° camera, to magnetically attach to the phone. The pins transfer power while data is transferred wirelessly via a 60GHz, 6 Gbps connection. Modular phones are not new—LG tried and failed with the G5 and Google’s concept never made it to production. Motorola’s Moto Mod system, which also uses magnets for attaching accessories to the back of its Moto Z phones, is the best implementation to date, but, like the other attempts, requires some compromises to the phone’s design. I’m not sure Essential’s solution will be as flexible as Motorola’s in terms of the types of accessories that it will accommodate, but it’s the first system that does not appear to negatively impact the phone’s thickness, weight, or battery size. Around front there’s a nearly edge-to-edge display covered by Gorilla Glass 5. Like LG’s G6 and Samsung’s Galaxy S8, the Essential’s display is stretched vertically, resulting in a larger screen that keeps the frame narrow enough to comfortably hold with one hand. We’ve seen several OEMs move away from traditional 16:9 displays recently, but there’s still no consensus on what the optimal aspect ratio should be. The G6 (18:9), S8 (18.5:9), Xiaomi Mi MIX (17:9), and now Essential (19:10) are all slightly different, with the G6 and S8 opting for narrower screens. 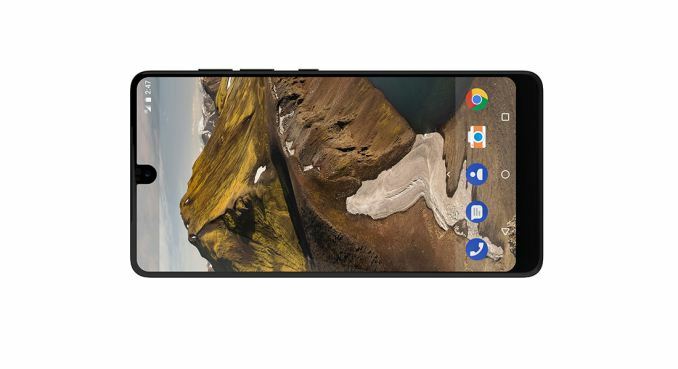 The Essential’s unique 5.71-inch IPS display has a 2560x1312 resolution and rounded corners. Unlike the Mi MIX that uses IGZO (indium gallium zinc oxide) thin-film transistors (TFTs) in its backplane to improve efficiency, the Essential uses LTPS (low-temperature polysilicon) transistors that are commonly found in flagship IPS displays. The Essential uses onscreen navigation controls, leaving only a slim bezel below the screen and very little surrounding the edges and top. The top of the display is scalloped, making space for the front-facing 8MP camera and the ambient light and proximity sensors. This means the camera lives in the middle of the status bar along the top of the screen, which is either a clever use of wasted space if you prefer an uncluttered status bar, or a potential annoyance if you prefer to pack this area with information. A very thin and wide earpiece sits above the camera right along the top edge. I’m not sure how it will perform, but it’s incorporated in a way that makes it almost invisible, which is pretty neat. 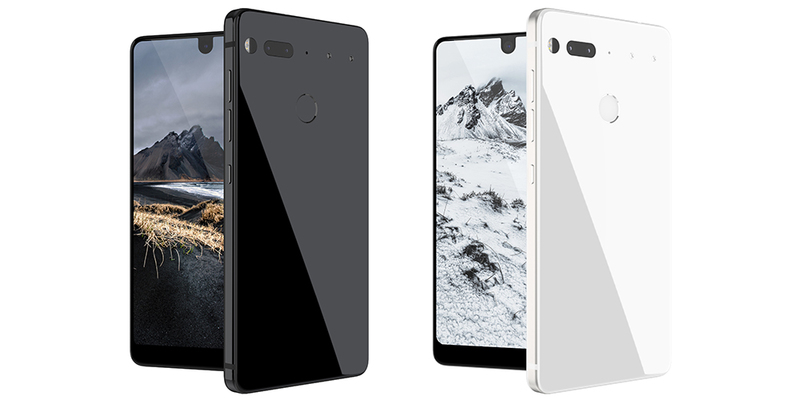 The Essential phone is currently available for pre-order directly from Essential Products for $699 (US only). For a limited time, you can get the 360° camera accessory for an additional $50. Color options include Black Moon (black frame) and Pure White (silver frame), with Stellar Grey (grey frame) and Ocean Depths (green with gold frame) coming soon. I can't wrap my head around the design decision of the front facing camera impeding on the screen like that. It looks just awful and utterly destroys the phone for me. When you consider how much bezel there is at the bottom of the screen to intrude into, they should have just done what Sharp did with their bezel-less phone and put the camera at the bottom. Seems like a missed opportunity. That's a trade-off of having as much screen real-estate as possible and the desire to cram everything into one device. No one else mentioned this, so it seems there will be people ok with it. Unless someone invents a camera that can be invisibly be part of the LCD screen there's no way you won't ever see these compromises in other min screen bezel phones. I have a Moto G4 Play. Not $30, but cheap enough, and I'm mostly happy with it. The camera however is... Not good.